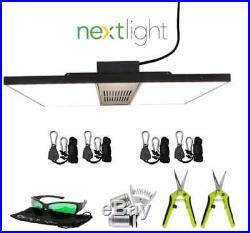 This kit will include the following in addition to a NextLight Mini LED Grow Light. 2x Grow Crew Ratchet Hangers. 2x Grow Crew Trimming Scissors. GroVision Glasses (to protect eyes from LED Light rays). Use for Flowering in Restricted Spaces. The NextLight Mini is a full spectrum, bright white LED grow light designed for flowering in restricted spaces. Hence the name, we harnessed the same high intensity light of the NextLight Mega and redesigned it for use in smaller spaces. Using only 150 watts, this light is perfect for small tents and any space where venting and air conditioning are an issue. The Mini covers a 2 ft x 2 ft flower footprint and a 3 ft x 3 ft veg footprint. 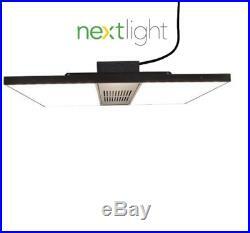 This unit is part of the NextLight Commercial Series. The Mini is designed to meet the needs of commercial and home growers alike. We understand excessive power consumption, bulb replacements and heat are the biggest problems indoor growers face. The NextLight Commercial Series alleviates all of those issues. Coming in at 1.73 PPF/Watt, the Mini is the most efficient full spectrum LED in its class, period. NextLights Full Spectrum provides the same sun-like qualities plants love without the negatives of high energy requirements and high heat. Using NextLights Full Spectrum you will see faster growth, tighter internodal spacing and increased production overall. Flower Footprint: 2 ft x 2 ft. Veg Footprint: 3 ft x 3 ft. Unit Dimensions: 18 in x 22 in. Operating Volts: 120v - 277v. Made in the USA: Of US and Imported Parts. The item "NextLight Mini LED Grow Light 150W Watt 3' x 3' Footprint FREEBIES INCLUDED" is in sale since Thursday, July 5, 2018. This item is in the category "Home & Garden\Yard, Garden & Outdoor Living\Gardening Supplies\Hydroponics & Seed Starting\Grow Light Kits". The seller is "wholesalehydroponicssupplies" and is located in Multiple Locations.